My website was down for a couple of days. My domain registration lapsed; Yikes! I had changed email addresses and I forgot I had a a different domain registrar than the hosting company and I didn't update my email address with the registrar. Well, after I got the name servers figured out it was back. It has been cold out. It got down to zero the other night. 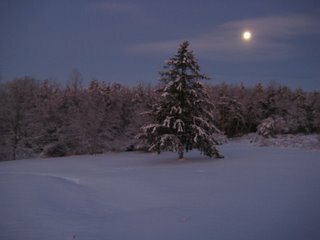 DJ and I went for walk in the full-moonlight the other evening. It was cold. We saw shooting stars. One looked like it was only a few thousand feet away! It looked more like fireworks than a shooting star. It was close! I guess shooting stars have to land somewhere; why not Berkshire? The flame went out before it hit the ground, but it wasn't that high up. Dress for the cold and it is a lot of fun outside this time of year. There is a lot to see and it helps keep you grounded on your natural environment. The mean rooster went for a ride recently. He was dubbed "Roto-Rooster". The idealic winter scene is the front yard.